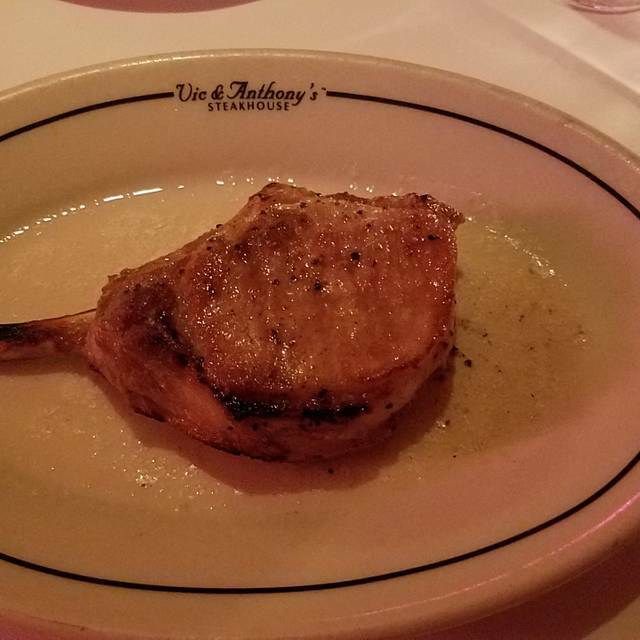 You must make reservations at least 5 minutes in advance of the time at Vic & Anthony's Steakhouse - Las Vegas. Visit www.vicandanthonys.com for more information. Vic & Anthony's is ideal location for your next party, celebration or business dinner. We can accommodate groups of up to 60 in our Mezzanine, 10 in our Vegas Room and 35 in our Tasting Room. Our Main Dining room is able to accommodate up to 70 guests. Contact our Sales Manager, Jennifer, at 702.386.8399 or JShimizu@GoldenNugget.com to book today! 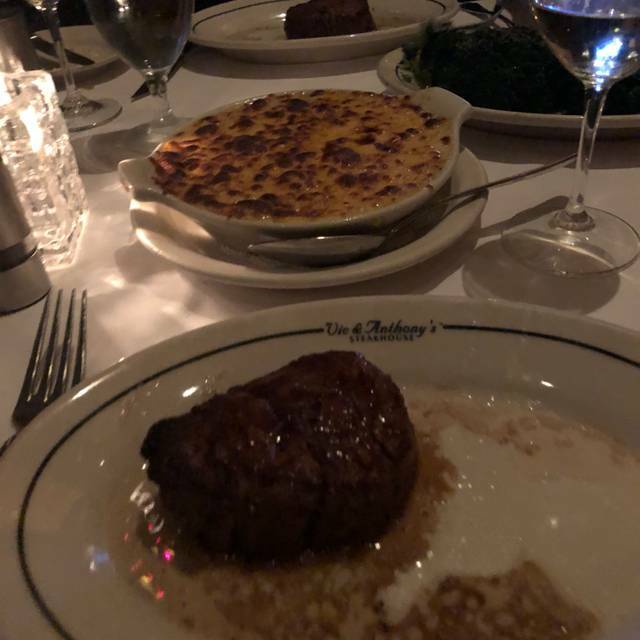 Vic & Anthony’s Las Vegas is consistently voted one of America’s ten best steakhouses as well as top rated in Las Vegas. 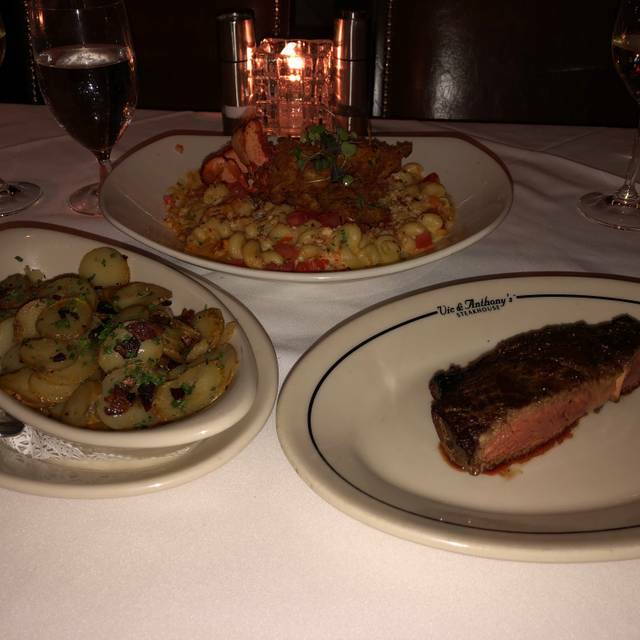 Featuring only the highest quality beef, live Maine lobster, unique appetizers, as well as an eclectic wine selection and impeccable service, Vic & Anthony's Steakhouse delivers a memorable dining experience in a classic ambiance. Wonderful service with John as our favorite waiter. Food was absolute perfection. Vic & Anthony's is a Vegas treasure. Excellent steak quality taste and prep. Sides are large and a little too rich (cheese overpowers the potatoes and the creamed spinach). 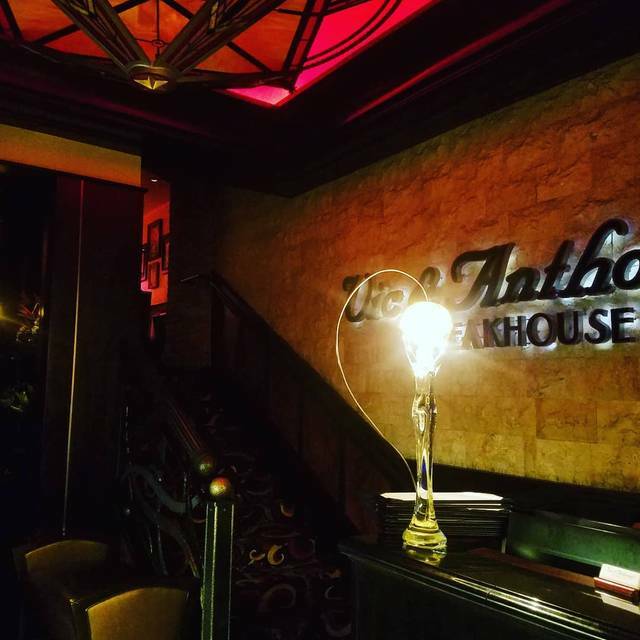 Ambiance is your classic, old time steakhouse, very dark. It’s hard to see your steak/meal, so order the filet if you don’t want to use your phone flashlight to cut out the fat from the ribeye. Very expensive for what you get, so not likely to make it a “must do” for our annual LV trips. Real good. Highly recommend. Great food, atmosphere and service. Enjoyed the filet and lobster... and of course the wine list, Honig is always one of my favorites. Can’t wait to go back. We come to Vic & Anthony's every time we are in Vegas! This is the second time we dined at Vic & Anthony’s. The first time was outstanding so we were excited to dine there again. What a huge disappointment. The ribeye cap was so fatty, it wasn’t worth eating. The filet was so dry, it was inedible. For $300 plus tip, the meal should have been better. The best part of the meal was the bread!!! After recommendations about this place to a lot of friends and family, we will need to tell them it’s not worth the price. Luciano was fantastic!!!! He is the true definition of why we had such a great experience for our first time eating there! Amazing food also! We go here anytime we get the chance! Kids, Friends, Date Night.... we love it. Great server named Hector. He went over 100% to make our experience the best! We would definitely recommend this restaurant and Hector. Vic & Anthony's was empty when we arrive exactly at opening time and were the first to enter, but they seated us at what appeared to be the worst seat in the house. My daughter was in a wheelchair and they made her climb three steps to be seated when there were plenty of tables on the main level. When I asked for a table without steps, I was informed it would be a 15 minute wait. I'm 78 yrs old and was required to crawl over another seat to get to my seat because it was in a corner with no space behind or in front of it. The waiter could not reach my place, thus I was required to reach for my food and hand him my empty dishes. They also could not reach my water glass so didn't bother to refill it. I will say that I had one of the best Filet Mignons I've ever had and it was perfectly cooked. I am a foodie and this is one of my favorite restaurants in Vegas. I usually go to non-chain restaurants but this is my exception! Highly recommended!! See you in June!!! Perfect place for a good stake. We had reservation but too much wait to get table. We had same experience last year. Had to wait 20 minutes past our reservation time but after we finally got in all was good. Great food, great service and great ambiance. Everything was great with the exception of having a large, TV in the bar playing sports. The flashing light of the TV pretty much ruined the high class ambiance of the dining experience. I have been to Vic and Anthony’s many times but was disappointed to find out it is now trying to be a sports bar as well. I will not be willing to pay the high prices charged to sit in a sports bar with people watching football. Amazing dining experience. Very friendly staff and ambience was just perfect. Great food, great ambience. 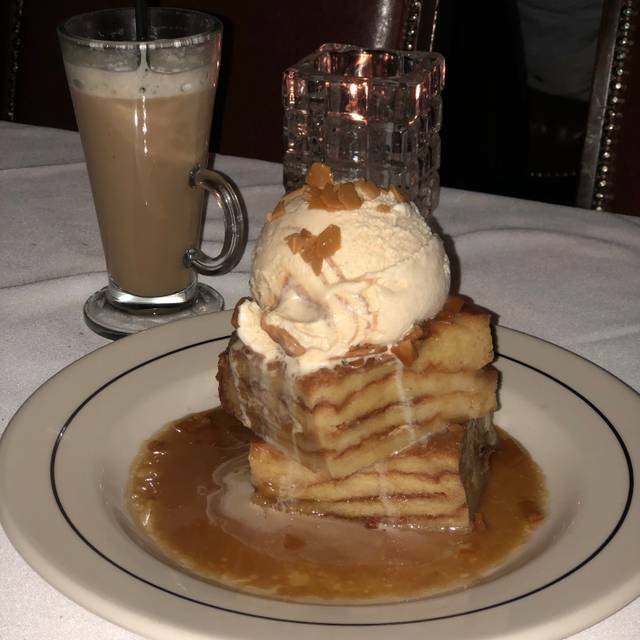 The desserts are solid, save room. I had the bone-in filet, a can’t miss option. Cooked perfectly at medium rare. Au gratin and Brussels on the side. The server made us feel very out of place. I checked the website and we were dressed appropriately. He seemed to look down on us. The food was good. I expected melt in your mouth when I saw the prices. Overall nice, but not the best. Simply Outstanding Thank You. Everything was as expected great detail to all. Food was wonderful and really enjoyed the experience. A perfectly cooked steak and the lobster bisque was wow. Would recommend heading downtown for this, if you can. Fantastic upper end meal at fair prices with great service! Victor was a great server, we had an amazing meal and a delightful dining experience! Four of us split the tomahawk steak and it was so delicious! Our waitress was very knowledgeable and friendly. She helped us figure out the perfect meal and made sure we were tended to. The steak is one of the best I have had! Did not enjoy at all, food was bland and overpriced. 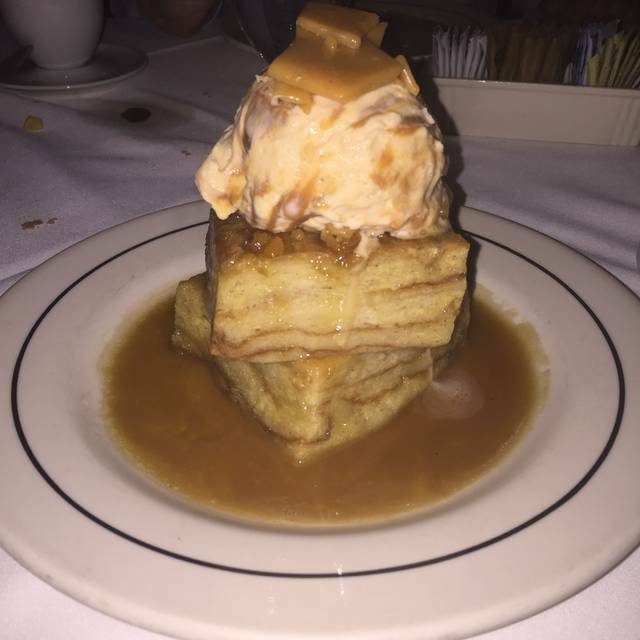 We have no problem spending good money on good food in Vegas, and this place did not live up to our expectations. It was also too dark. The food and service was excellent with pricing appropriate. Service was amazing - very attentive without being overbearing and hovering. The food was great, though I personally found our ribeye to be lacking something - but I can't put my finger on what. The asparagus and duck fat potatoes were fantastic, though. 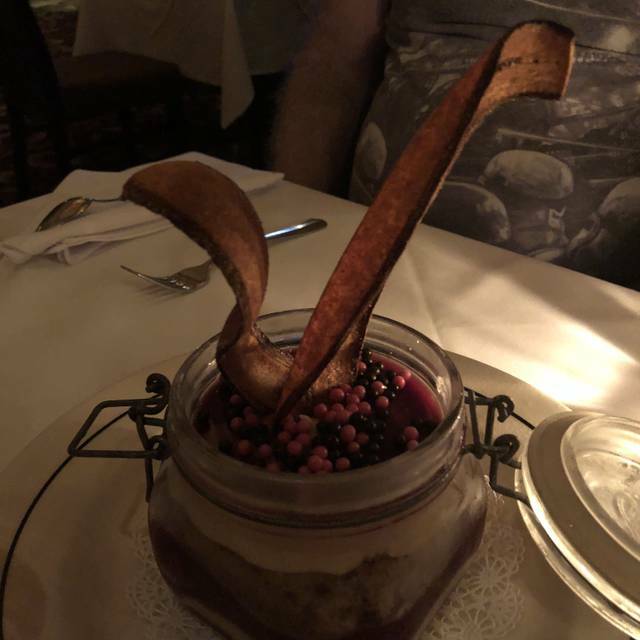 It was a special occasion (my husband's birthday,) and noting that on my OpenTable reservation resulted in us receiving a small dessert with a candle - and little fanfare (which was good - he'd have been otherwise embarrassed). Such a lovely touch. Overall, it was a great experience, and we will certainly plan to return. Go to V & A quite often. Service has always been very professional. Our server this time....she was not as professional as all our other times. Bit disappointed in that. Filet was not cooked as requested. Waiter was not attentive. We always try to go here when in Vegas. Food is always great. 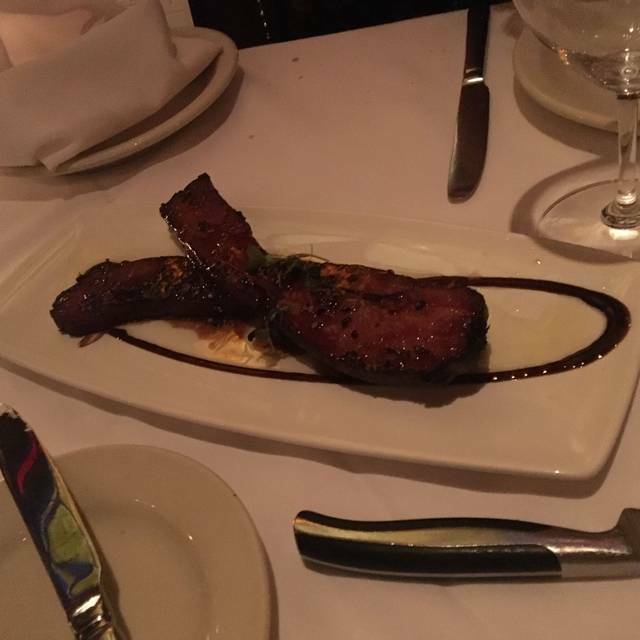 Do yourself a favor and order the bacon appetizer. You won't be disappointed! I've eaten at a lot of 5 star restaurants & this was by far the best dinner I've ever had. The lobster & ribeye melts in your mouth!! Everything was cooked to perfection! Service was great too! WE have been eating there for years first bad meal, they brought a Greek salad that was not even close to a Greek salad, sent it back and the manager agreed, the Lamb Chops were 50% fat, and the baked potato which was ordered with Butter and Chives had to have had at least a full stick of Butter. I spoke with the manager and he was very surprised. 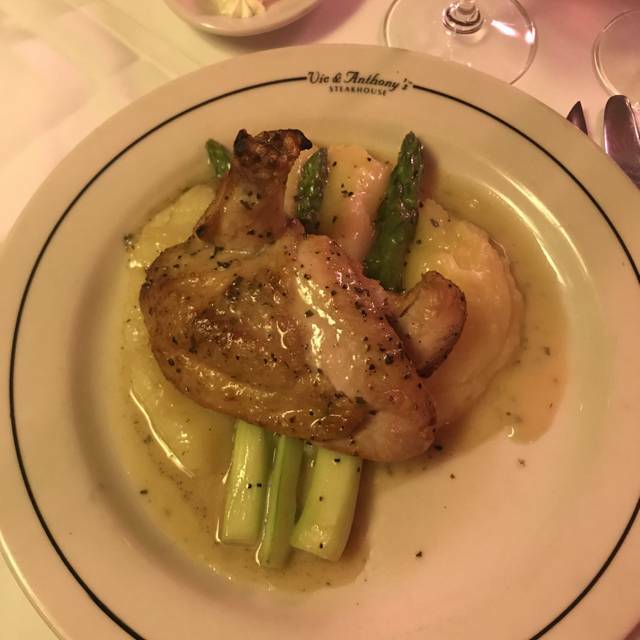 They are a great restaurant, as I stated before first bad meal ever, Maybe it was due to March Madness as they were booked solid with a 2 hour plus wait. We will be going back. Steak and lobster special was delicious. Ribeye was fine and the au gratin potatoes were full of cheesy goodness. Stick to the steaks, my salmon was not cooked well at all. Very overcooked bordering on burned and tasteless. Great steak house. Got the filet and it was tasty! The food was delicious and the waiter was super nice.